Joe New place, new set of washing machines to beat my head against. Actually, the machines themselves haven't changed that much this time, but the washing machine culture out here in Flogsta, well, that's something different. 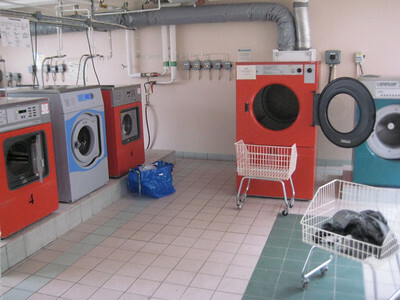 The fancy booking system back on Dragarbrunnsgatan meant that one could book the laundry room a week in advance, and then have it completely to yourself for a three hour block. Not the most efficient system, from a washing machine usage point of view, but awfully convenient—no trudging down to the laundry room with a full hamper just to find that there's no room at the inn. Now we're washin' it Flogsta style, though. What does that mean? This is a pretty big complex, so there are four laundry buildings, each with 6 washers and four or five high-capacity dryers (plus and ironing board, and an electric mangle, just in case you decide you don't like having fingers anymore). That's one tvättstuga to just under 200 apartments, or if you prefer, one washing machine per 281 tennants. Nevertheless, it seems to work out pretty well; they are mostly students, after all, so they can't be doing laundry as often as they should. The first time I went, I tried the middle of a weekday afternoon, which up to now has guaranteed me a pretty empty laundry room. Again, though, students now, so naturally 15:00 Tuesday is a prime laundry doing time. There was an empty machine, and I proceeded to load into it, but then I encountered something you don't come across that often here: a chatty Swede. This fellow helpfully pointed out that the machine I was about to use "hadn't been working so well today," (indeed, upon closer inspection, I think it was completely broken), but that there was another one that was "on zero" (all the machines have countdown timers, so this was just a machine that had finished its load) which would probably be a better bet. It's a good thing he was there, actually, or I would have felt a little tentative about the procedure: apparently, when someone's wash is done you just take it out and put it in one of the dozen or so white wire laundry carts scattered around the room. The Swede said, "It's a very un-Swedish system actually, but it works. You just put the clothes in a basket, and no one gets mad that you moved their clothes." He then went on to detail his long standing feud with the crazy girl who uses all six machines at once to wash her equestrian gear and saddle(!? ), which he doesn't think is allowed, never mind that you just can't take all the machines. He said that once she was using five machines, and when he started to load the sixth she said he couldn't because she was going to need that one, too, but he explained, "Look, I'm sure that works in southern Stockholm or wherever you're from, but you just can't do that here, even if you do use that tone you just tried on me that I'm sure used to work on your mother." I'm telling you, once you find something they're interested in, the floodgates they do open. Oh yeah, almost forgot: see the little blue bag on the floor? The virtually ubiquitous laundry bag of Flogsta, better known as an Ikea shopping bag. Well, many loads of laundry later, we're all clean here again. It's been a long and sort of trying week for a variety of annoying little reasons (such as Jennifer's recently contracted head cold), some of which we'll try to cover over the course of our quiet and restful (fingers crossed) weekend. 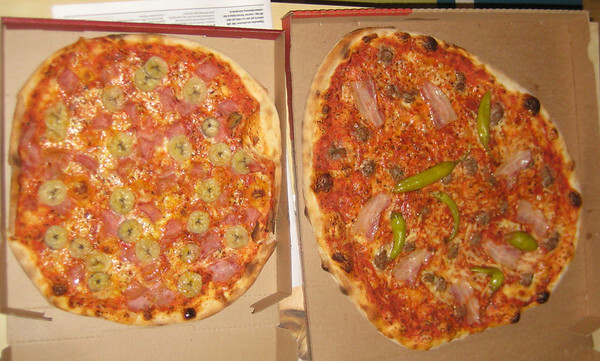 In any case, we decided we deserved a treat, so tonight we ordered pizza from Luna, the little pizza place in the apartment complex. We've hesitated to do it, as the menu has some oddities, but tonight we figured we should just try it. We ordered a Mexico (ground nut, pepperoni, and bacon?) and a Tropikana (ham, bananas, and curry—verdad!). OK, so by pepperoni I think they meant banana pepper, but the "ground nut" must have been a mistranslation, because it was Italian sausage! The bacon was in three inch long strips, odd but tasty. Oh, yes, the bananas and curry with ham? Well, it tasted like bananas and curry with ham, which really was pretty good. Live and learn, I guess. By the way, Jennifer informs me that since this post is about infernal gadgets and our relationship to them, I am morally obligated to relate the final word on the little Husqvarna dishwasher. After the first week, it functioned only as the most expensive, awkward and inefficient dish drying rack we've ever had. Sigh. Farewell, little Husqvarna. Maybe someday you'll grow up to be a sewing machine, or if you work very hard, a chainsaw.